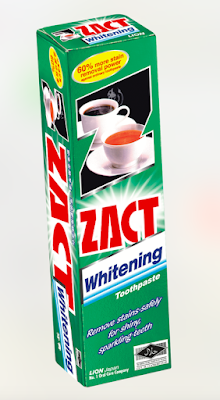 ZACT Whitening | Senyumlah dengan lebar dan swafoto, kemudian zoomkan pada gambar anda dan perhatikan gigi anda dengan teliti. Adakah anda nampak sebarang kotoran atau warna kuning pada permukaan atau di celah-celah gigi? Tekupkan tangan anda pada mulut dan hidung, hembus nafas dan hidu – adakah ianya berbau kopi atau teh? 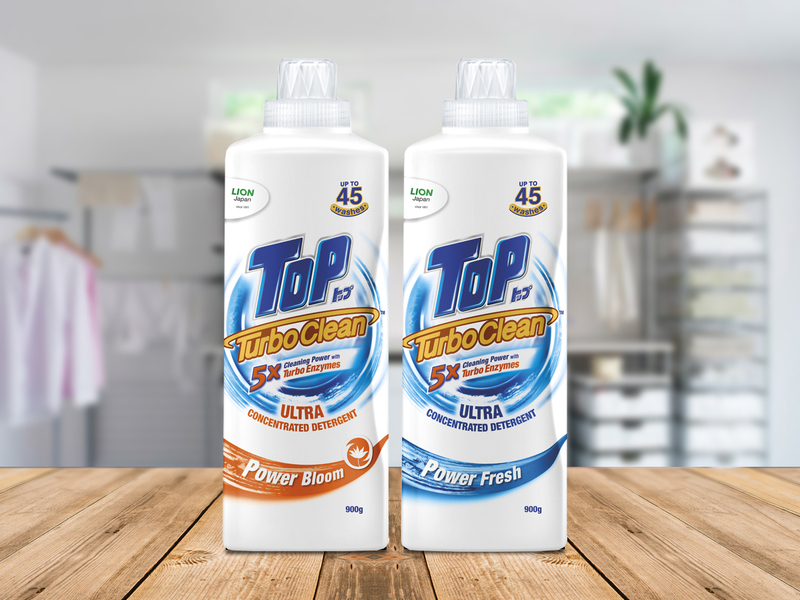 TOP TurboClean Ultra Concentrated Detergent | Adakah mencuci pakaian menjadi rutin rumah yang paling lama, membuatkan anda tidak mempunyai banyak masa untuk bersama keluarga, kawan-kawan atau menikmati pengalaman baru? TOP, jenama pencuci No. 1 di Malaysia kini merevolusikan pengalaman mencuci pakaian apabila membuktikan bahawa cucian penuh kuasa didatangkan dalam pakej kompak menerusi pengenalan TOP TurboClean Ultra Concentrated Detergent. 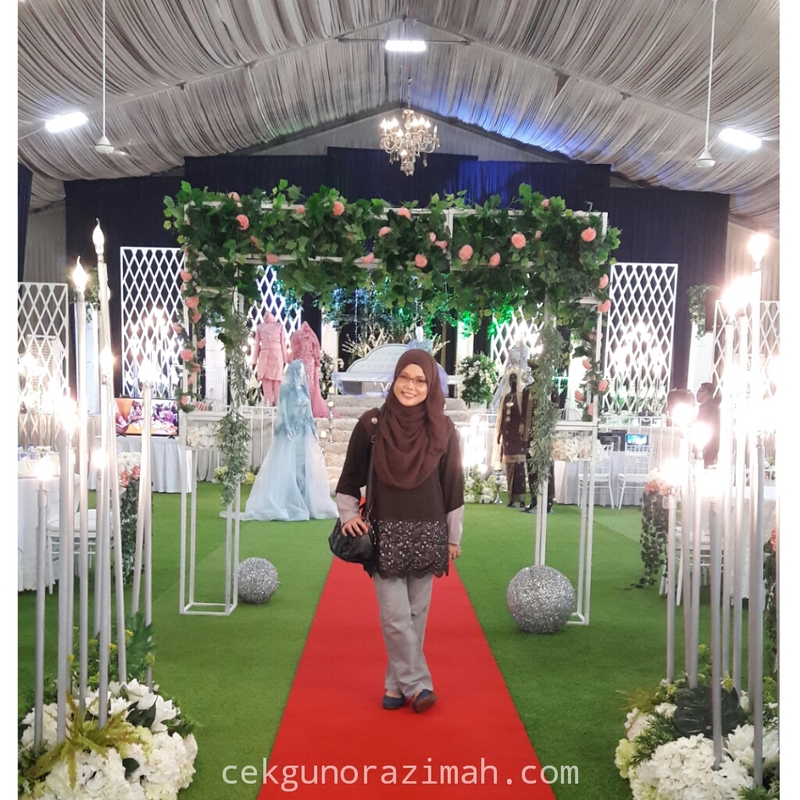 Ia mampu memberikan 5X kuasa cucian dengan enzim turbo yang bertindak pantas untuk mengeluarkan kotoran lebih cepat menerusi satu penutup kecil sahaja. Menurut Pengurus Pemasaran Southern Lion Sdn. 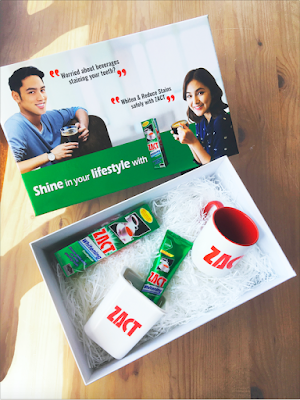 Bhd., Encik Leroy Yoon, dengan pengenalan TOP TurboClean Ultra Concentrated Detergent yang kompak ini, satu segmen bahan pencuci premium baharu yang berprestasi tinggi bakal dibentuk. Sasaran utama produk ini adalah pengguna yang menghargai innovasi terkini yang memudahkan rutin mencuci pakaian serta menambah baik gaya hidup mereka, selari dengan janji jenama TOP iaitu Innovation for Better Living. 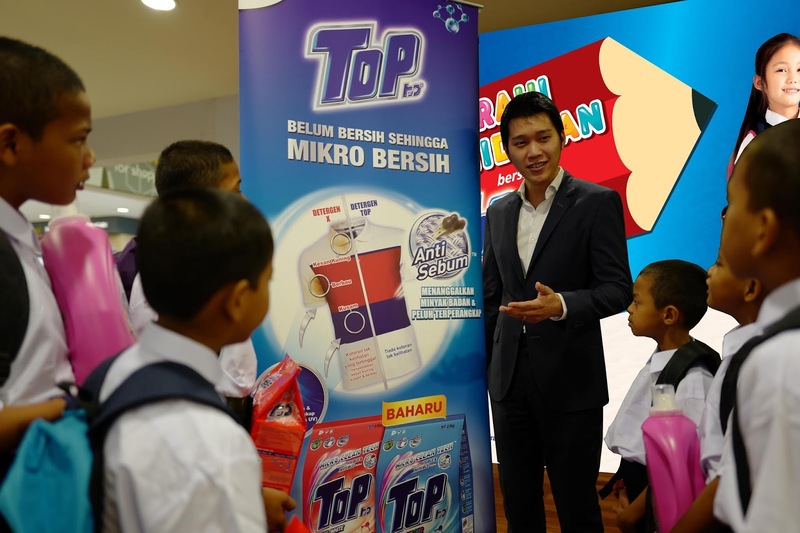 Subang Jaya,January 4, 2018 –TOP, the No.1 brand in Malaysia brought back-to-school cheer to 500 children from selected NGOs from across the nation, through its ‘A Brighter Future with TOP’ CSR campaign. The campaign is in its 4th year of providing school uniforms and other back-to-school necessities to a total of more than 1,600 children from 18 homes. 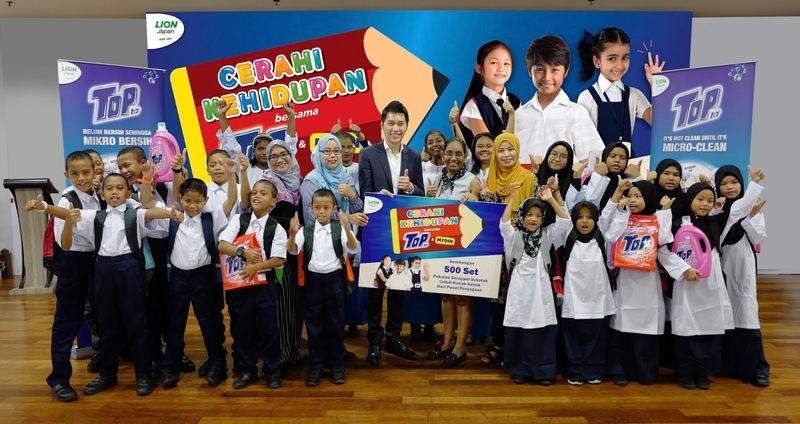 TOP collaborated with leading retailer, MYDIN to carry out the CSR fund raising campaign from November 15 to December 15, which saw 30 cents from the sales of selected TOP products from all MYDIN outlets nationwide channeled towards providing the back-to-school necessities for children aged between 7 to 17 years from 18 care organizations. The school necessities include a full school kit of brand new uniform, school bag and stationery set for each child. The campaign had two simple objectives, which is to give these children new uniforms that they can take pride in, that can motivate them to achieve more by boosting their self-confidence and self-esteem; and to educate them on the importance of a hygienic lifestyle, including caring for their clothing so that they are clean and hygienically laundered. Uniforms for children from care organization across the nation will be ready for collection before school reopens, giving the children the peace of mind that they will be dressed for success in the new school year. Southern Lion Sdn Bhd Marketing Manager, Mr.Leroy Yoon thanked MYDIN and its customers for their generous support of the program that has brought much hope and joy to children. “We are grateful for the support of MYDIN and their customers, who have given generously to support a cause that is close to our hearts, and that means a lot to children who have much less than what we take for granted. Their kind support has given hope and joy to children who can look forward to starting the school year with new uniforms, just like their other schoolmates. 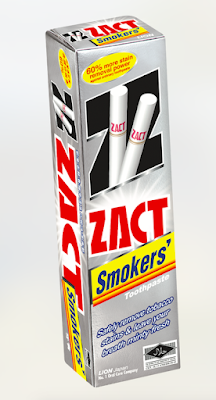 In return TOP is glad to provide the innovation and benefits of our products to all. We are proud to be part of an initiative that is motivating more children to enjoy a brighter future. Our thanks to all TOP users who have made this possible for the fourth consecutive year,”said Mr. Yoon. To find out more, please visit http://www.southernlion.com.my or call customer care line at 1800-88-0133. Why Wait in Line When You Can Send Flowers Online through Online Flower Shopping? 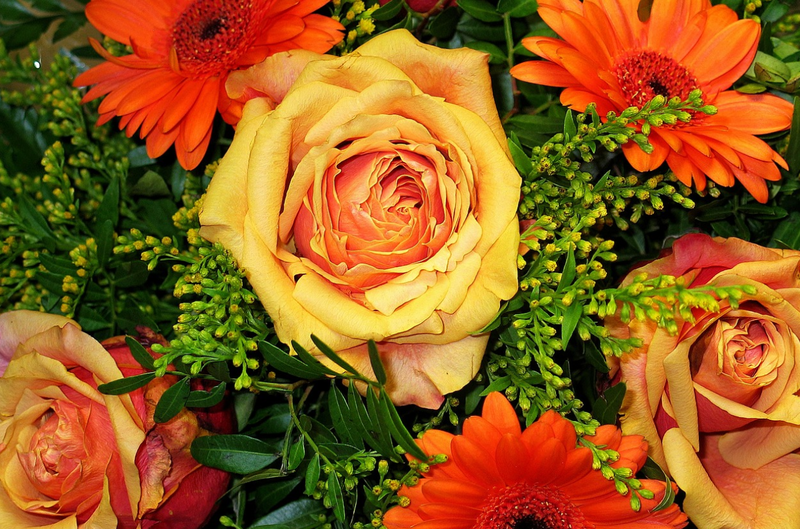 You can never go wrong with the gifts of flowers, especially when you choose to do online flower shopping. 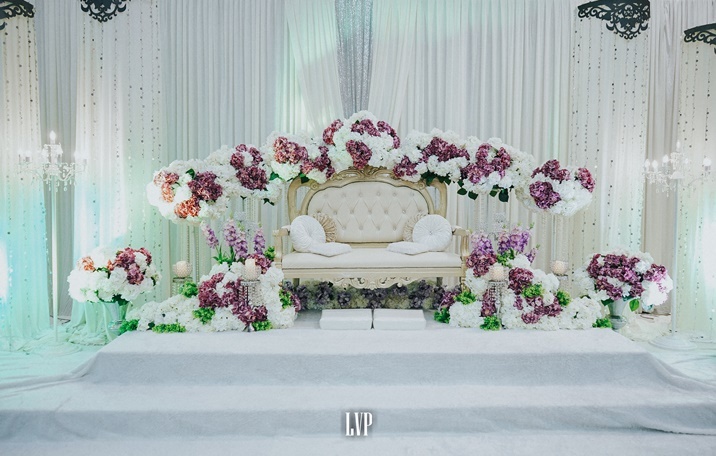 The Flower Delivery Singapore is a nice way to make each celebration more special and memorable. The Floristhas the most amazing gift of all, and that is the gift of flowers. But when you choose to send flowers, you don’t have to wait in line because online flower shopping is your option. 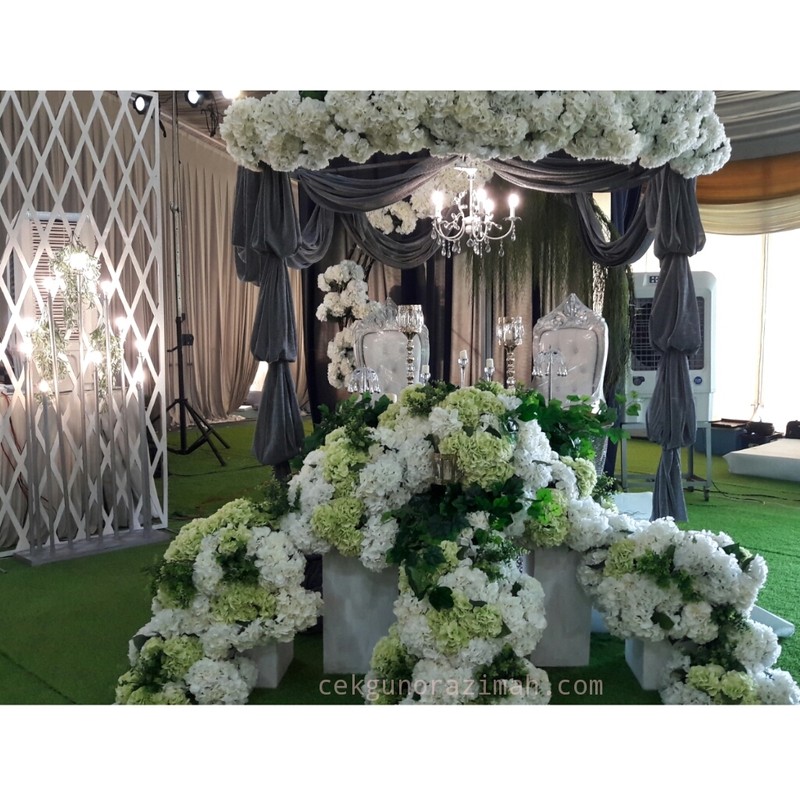 With the That Flower Shop, you can send flowers online to your loved ones in Singapore. 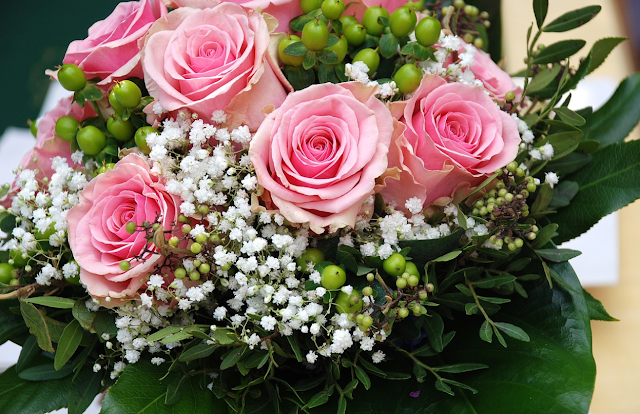 If you are looking to send a beautiful hand bouquet, the flower shopis your best place. No matter what the occasion is or what reason for celebration there is, the gift of flowers is proven to stand the test of time as the best item to send online. You can send birthday flowers or anniversary flowers or any gifts of flowers online to the people you love without the need to wait in line. Even on Mother’s Day, Father’s Day, Valentine’s Day, or on holidays, you can count on the online florist to give you the right design of flower bouquets. 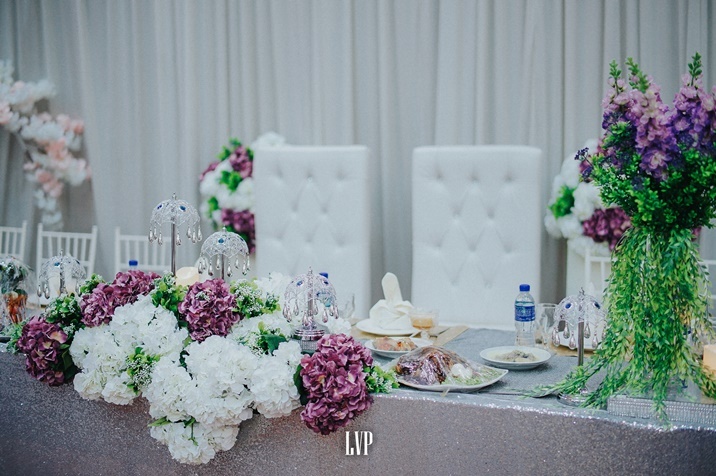 Every bouquet or arrangement of flowers is crafted and prepared by the florist. When you send one online, you are guaranteed that the fresh flowers are picked and sourced directly from local farmers. Whether you choose to send same day flower delivery or you want the flowers to arrive on specific date, the flowers will arrive fresh and in good condition. By online flower shopping, you can have high quality fresh flowers at the right time at the right place on special days or occasions. 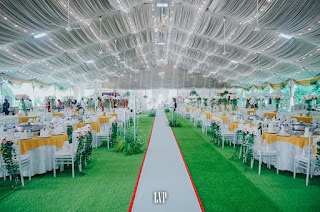 If you don’t know what flowers or bouquets to buy, or if you don’t know where to go to get the best flowers, the florist will be glad to assist you all throughout the way. With hand-crafted and hand-delivered flower bouquets that you can shop and send online, there is really no need to wait in line at any local flower shops or at the flower section in the grocery store. With online flower shopping, you can have the most beautiful bouquet of fresh flowers sent to your loved ones on their special days. The best thing with the online shopping and sending of flowers to anywhere is that you can avail the Flower Delivery for an affordable price. 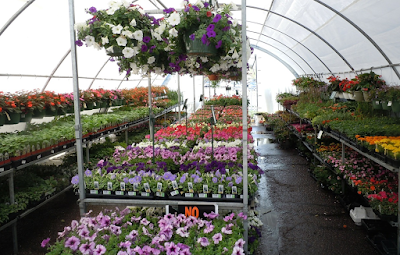 To be on a smooth flow, the floristshould learn to analyze sales. 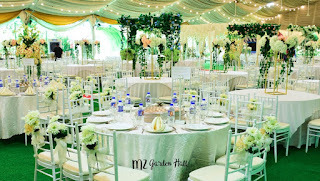 Based on records, the florist should track items that sell the most and those that don’t sell even on special occasions, especially on specific types of flowers. Since flowers will fade after a while, it will be a big loss for the business. By studying the inventory and records, you will be able to avoid taking those flowers that only perish in the stock room. To increase profit, you may want to upgrade your inventory. Aside from having several flowers and pre-arranged bouquets in your racks, consider selling live plants, potted plants, or other accessories to complete an extravagant gift, like greeting cards, stuff toys, gift items, balloons, ribbons, baskets, chocolates, boxes, gift wrappers, and more. 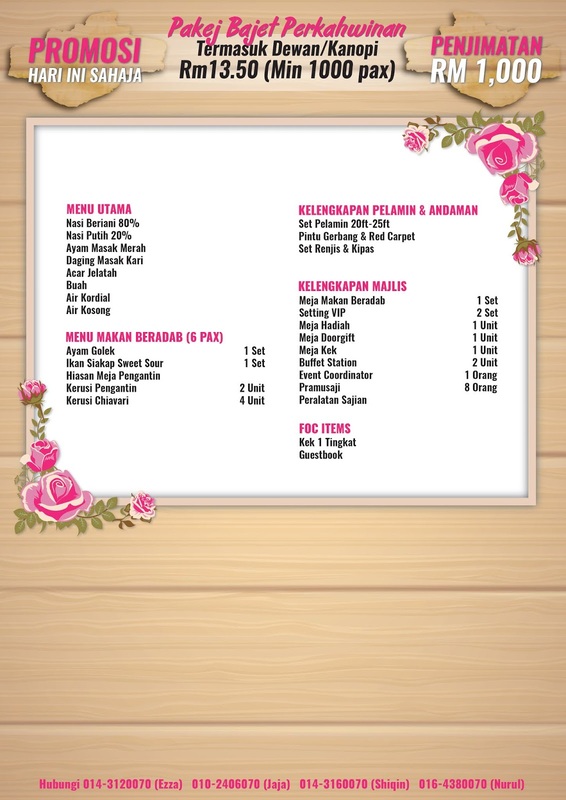 Make your flower shop deliverya one-stop-shop for flower gift shopping. 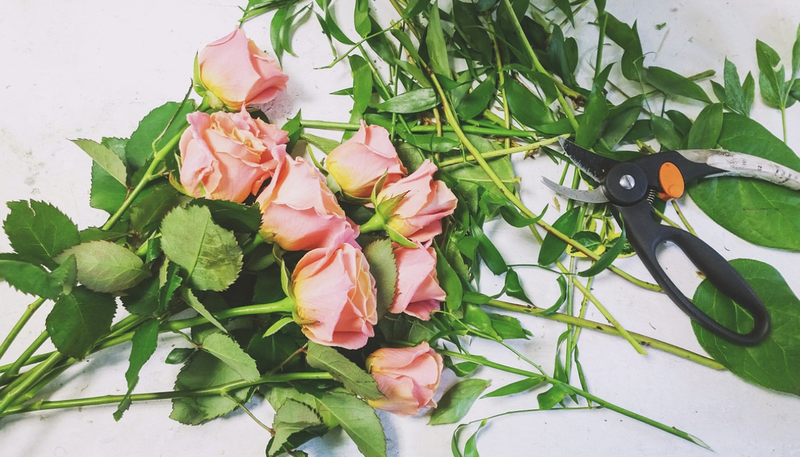 If you have the skills in floristry, maximize it and level up the arts of flower gifting. 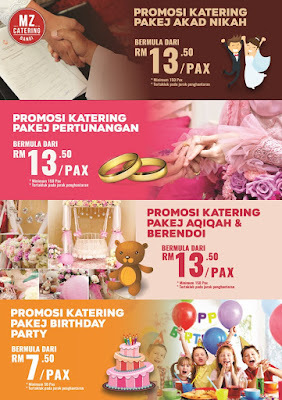 Create signature designs of hand bouquet, flower arrangement, and flower gifts. Also, add special touch to the wrappers, boxes, and other items. 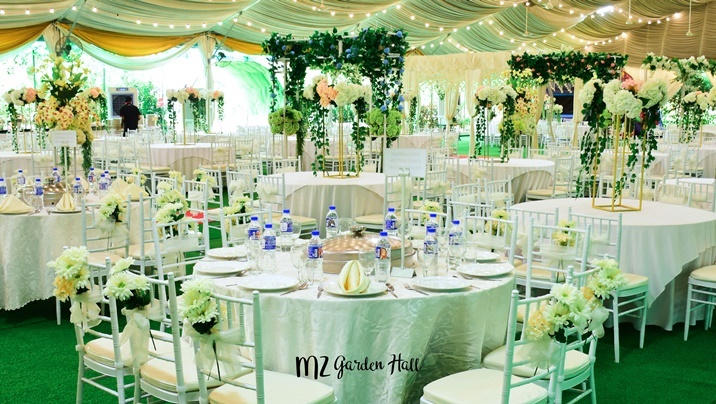 Another way to maximize floristry is to provide state-of-the-art florist services or special florist delivery. 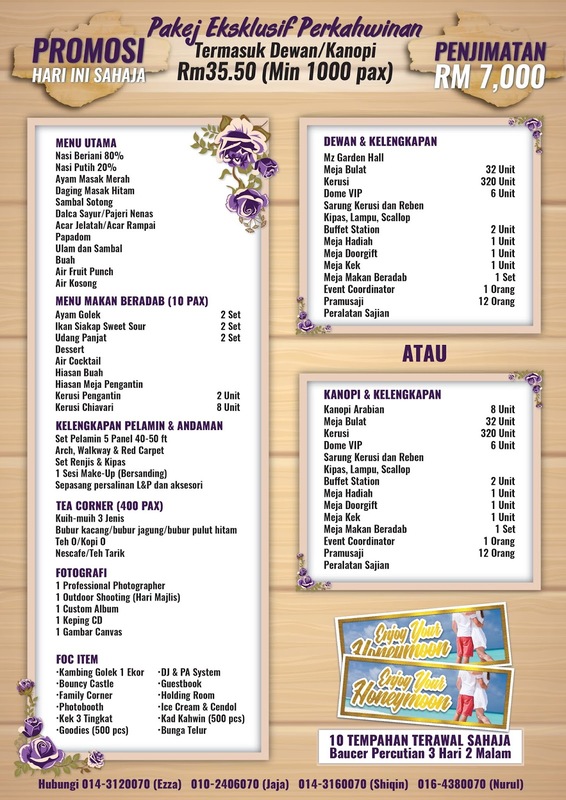 Make sure that the customers are happy and satisfied. To the local newspapers, magazines, and other prints in the city, adding your florist business to the advertisement section is a great way to tell the local neighborhood about it. 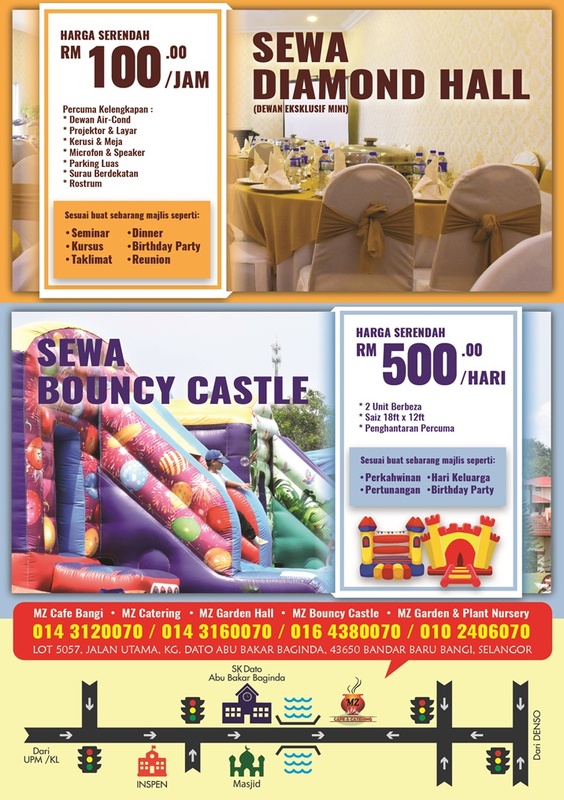 You can also try distributing flyers or business cards to potential clients. Ensuring the success of your florist business is more than just providing Flower Deliveryto customers. 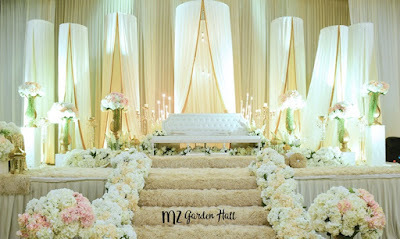 The services should also be excellent, as well as the flower shop. 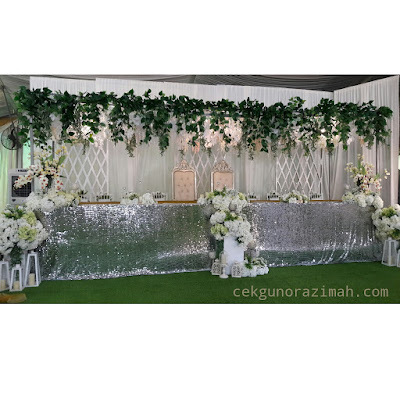 On a convenient location in the city, with nice, clean, and attractive store, many customers will surely want to do business with you because of your beautiful flowers and designs, and because of your warm and friendly services. BenQ Eye Care Monitor | Zaman serba moden ini, memang tidak lari dari gadget seperti hp, tab, laptop malah TV. 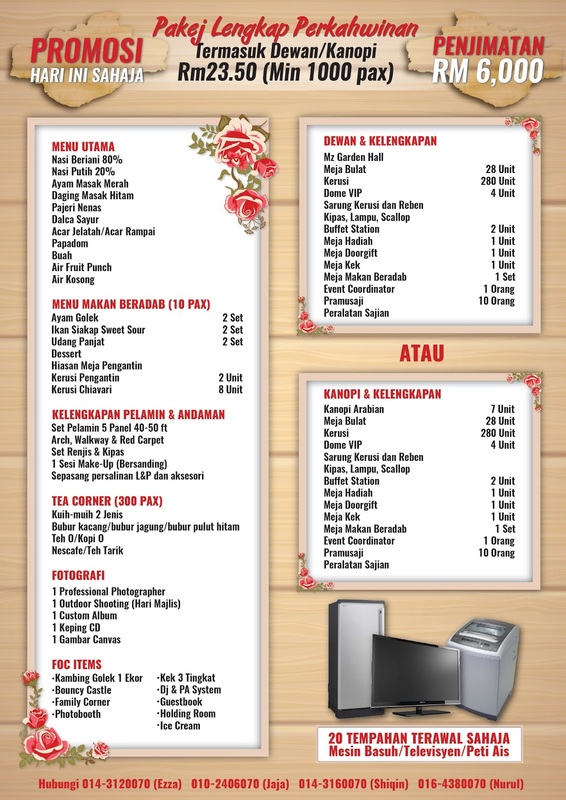 Semua gadget tu akan menyebabkan mata mudah kepada masalah silau & rabun. Begitu juga dengan anak-anak kecil yang terlalu terdedah dengan gadget pasti akan mengalami masalah mata. Kini BenQ memperkenalkan rangkaian BenQ Eye-Care Monitor yang pasti akan mengujakan anda yang mengadap komputer siang dan malam. 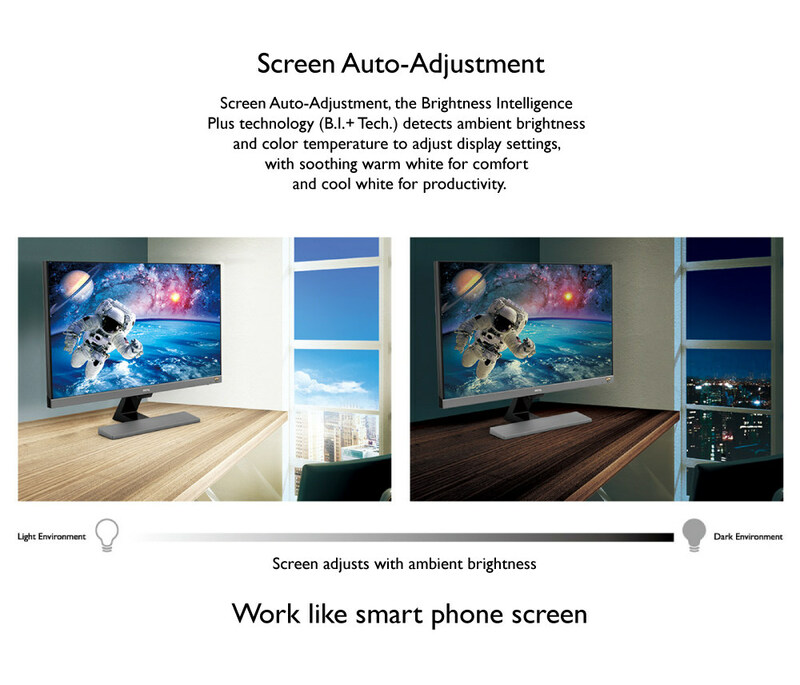 Tahukah anda bahawa BenQ Eye Care Monitor adalah Teknologi Brightness Intelligence Plus pertama di dunia? Baru-baru ini mereka telah mengeluarkan produk terbaru iaitu 4K DHR monitor dengan exclusive Teknologi Brightness Intelligence Plus. 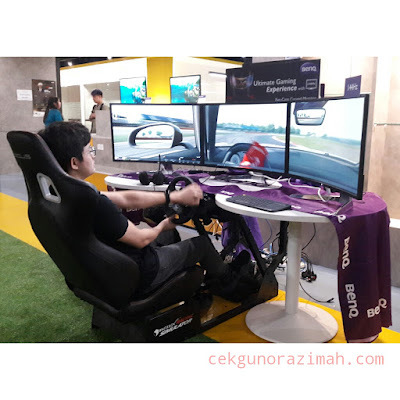 CN percaya gamers pasti akan sukakannya! 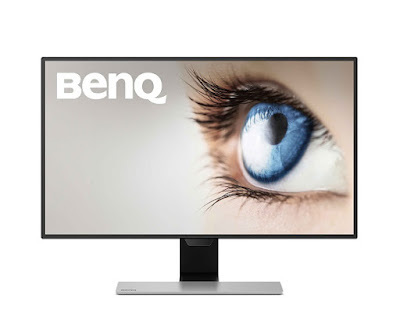 BenQ Eye Care Monitor adalah baik untuk mata anda. Ia bukan sahaja mengelakkan masalah silau dan rabun, malah memberikan keselesaan kepada mata walaupun berjam-jam anda mengadap skrin monitor. BenQ Eye Care monitor ini telah diperkenalkan pada tahun 2013 dengan teknologi Flicker-Free diikuti 2014 iaitu Low Blue Light Technology (LBL). 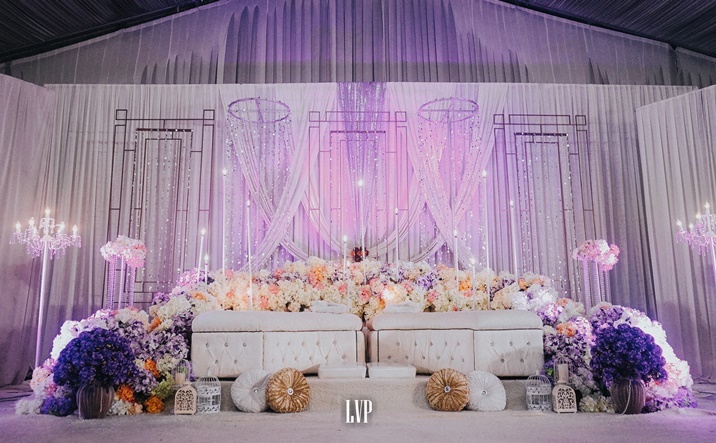 Pada tahun 2015, LBL telah diupgrade kepada LBL+ dengan kesan warna yang lebih 'hidup' dan cantik. Kemudian pada tahun 2016, teknologi Brightness Intelligence (B.I.) diperkenalkan dan pada tahun berikutnya 2017 ia telah diupgrade kepada B.I.+. 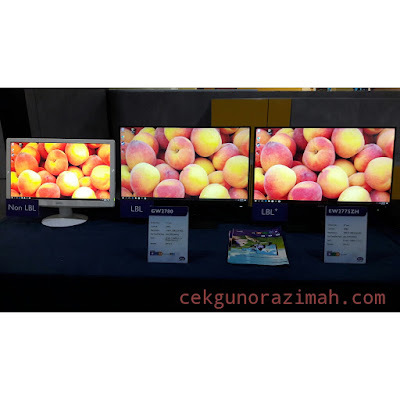 : Rangkaian monitor ini memberikan keselesaan kepada mata dari segi brightness. 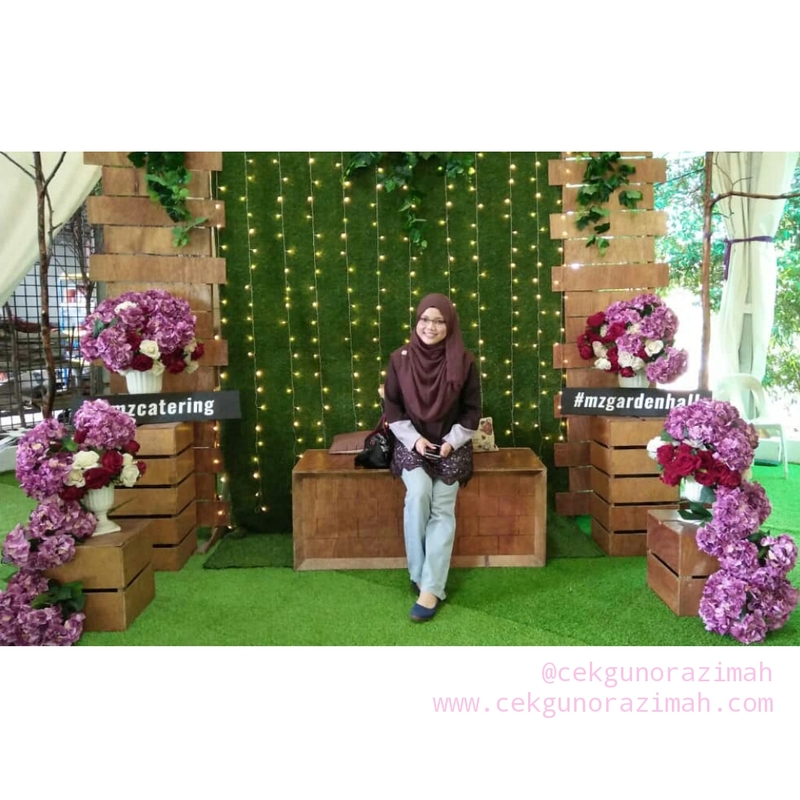 Walaupun mata kasar tidak mampu melihat perbezaannya, ia ketara apabila anda menggunakan kamera digital untuk melihat perbandingan BenQ Flicker-Free monitor dengan monitor Non Flicker-Free. 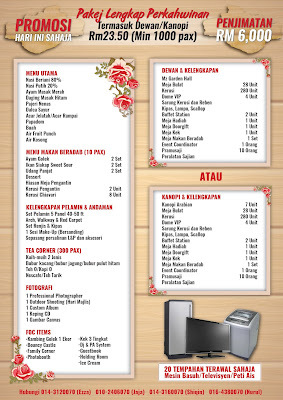 : Lihat gambar dibawah, begitu ketara bukan perbezaan monitor yang tidak mempunyai teknologi LBL dengan LBL dan LBL+. : Teknologi LBL ini kurang brightness tapi mempunyai kualiti warna yang kurang. Tapi dengan LBL+, warnanya lebih 'hidup' malah mesra mata pengguna. : Model terbaru iaitu EL2870U & EW3270U bukan sahaja memaparkan image yang cantik malah exclusive dengan Brightness Intelligence Plus (B.I.+) yang dibuat untuk memberikan keselesaan kepada mata. Teknologi B.I.+ ini mampu adjust kecerahan berdasarkan keadaan sekeliling seperti cerah dan gelap. 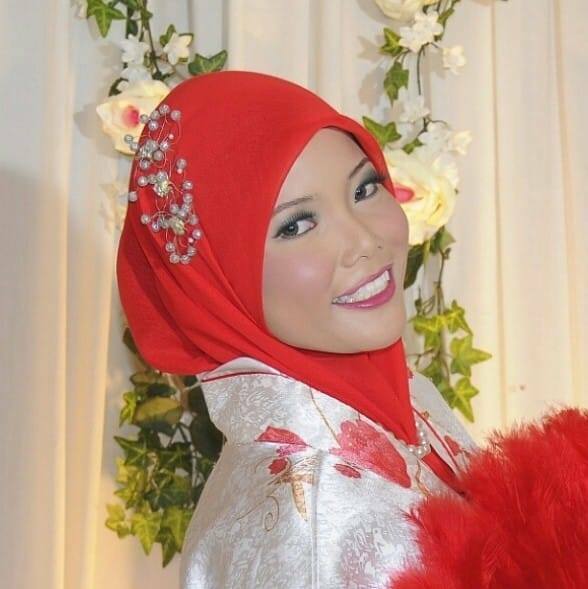 : Anda boleh lihat gambar dibawah bagaimana adjustment brightness seperti smartphone bukan? 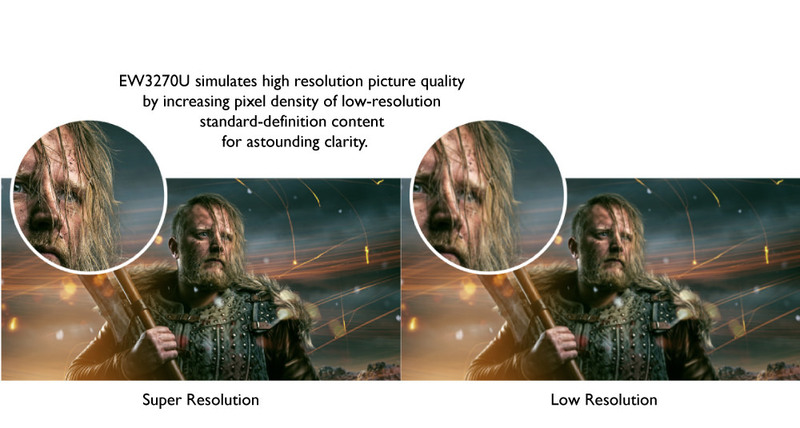 Kali pertama CN lihat rangkaian BenQ Eye Care Monitor, CN terus nekad untuk dapatkan monitor pintar ini. 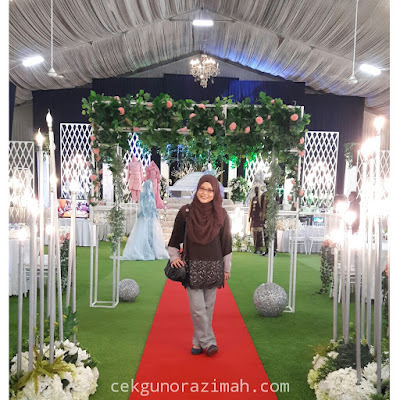 Almaklumlah, sebagai seorang cikgu Sains Komputer dan part time blogger, memang hidup CN mengadap komputer siang & malam. 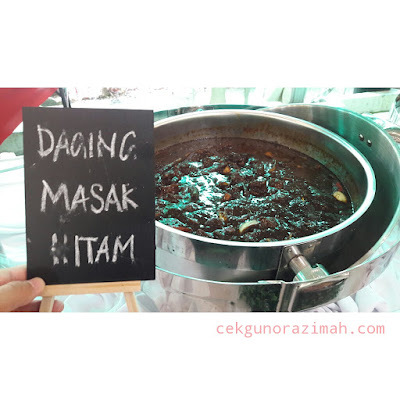 Paling seksa bila terpaksa siapkan task yang mengambil masa berjam-jam. Memang pedih mata mengadap komputer ni. Tapi dengan rangkaian produk BenQ Eye Care Monitor, bukan sahaja memberikan keselesaan kepada mata malah membantu mengurangkan masalah rabun dan silau. Kualiti cahaya juga memang superb. Dari Flicker-free, LBL, LBL +, B.I. & B.I+, semuanya best! Selain itu, anak-anak CN juga tidak lepas dengan gadget. Agak risau mata mereka rabun pada usia yang muda. 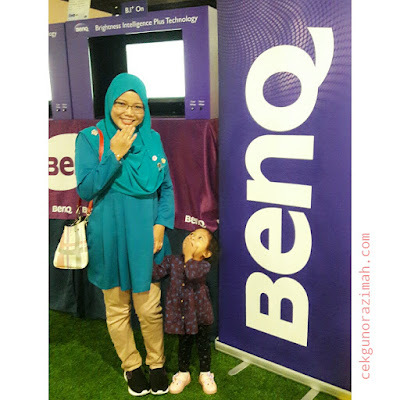 Jadi, sebagai langkah pencegahan, CN memang nekad untuk dapatkan BenQ Eye Care monitor untuk anak-anak tersayang. Harganya juga agak menarik di Lazada. 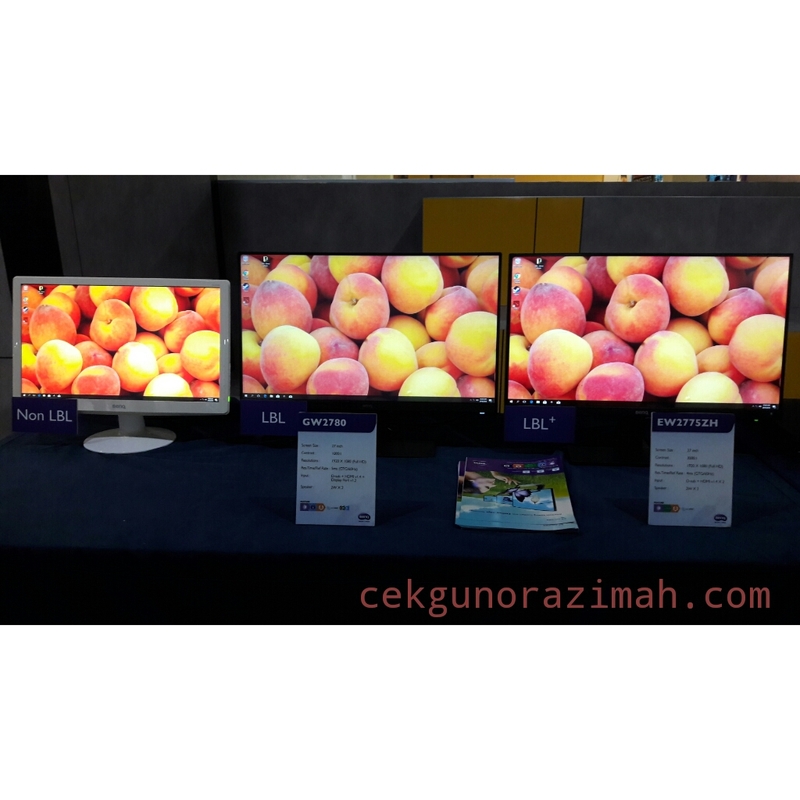 Maklumat lanjut mengenai BenQ Eye Care monitor, layari lamanweb BenQ.com.my. Pakej Lengkap Perkahwinan di MZ Catering | Agak sukar untuk mencari pakej perkahwinan lengkap di bawah satu bumbung. Macam CN dulu, sewa khemah, katering dan baju perkahwinan semua di tempat yang berlainan. Memang memenatkan ! Tapi di MZ Catering, bukan sahaja anda boleh menempah catering pada harga yang reasonable, malah anda boleh menyewa dewan yang bertemakan garden serta pakej lengkap bersama pelamin & baju pengantin. Menarik bukan? Di MZ Catering, anda boleh dapatkan pelbagai pakej lengkap perkahwinan mengikut bajet anda. 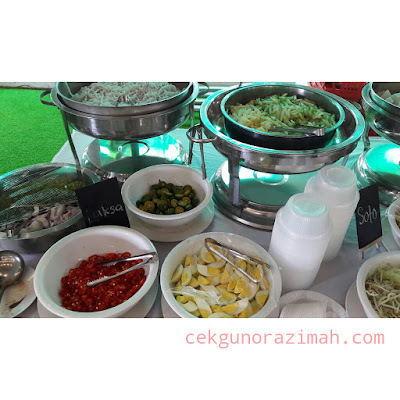 Baru-baru ini, CN sempat menghadiri Open Day MZ Catering. 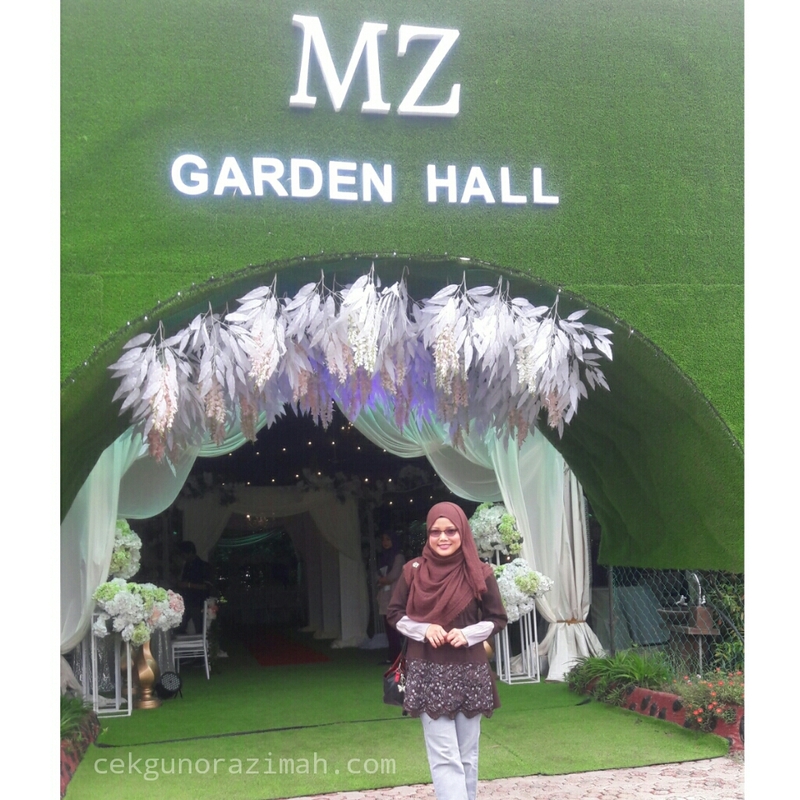 Wah, MZ Garden Hall semakin cantik tau. 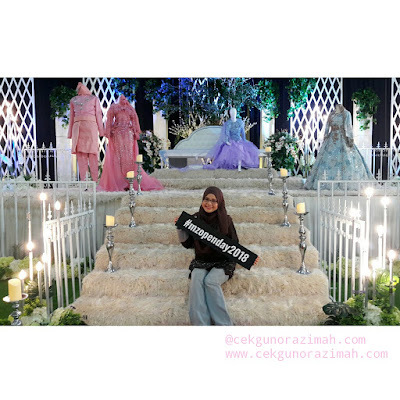 Awesome sangat ! 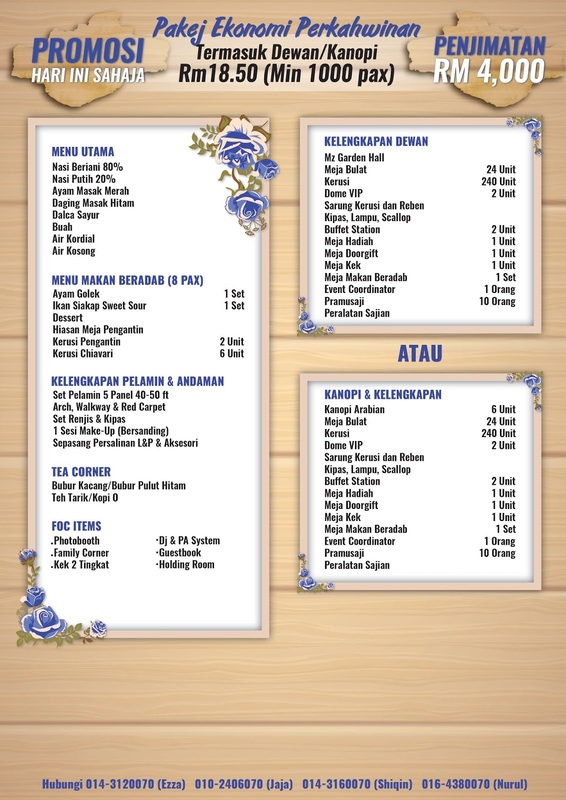 Harga pulak murah. 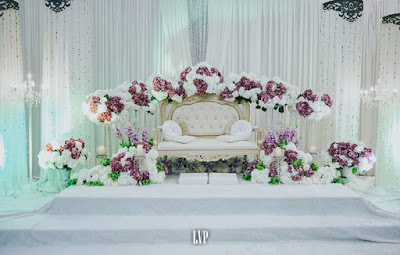 Berbaloi untuk bakal pengantin yang mencari pakej lengkap perkahwinan. Semua ada di MZ Catering! Kali pertama CN melangkah kaki ke MZ Garden Hall, wow ! 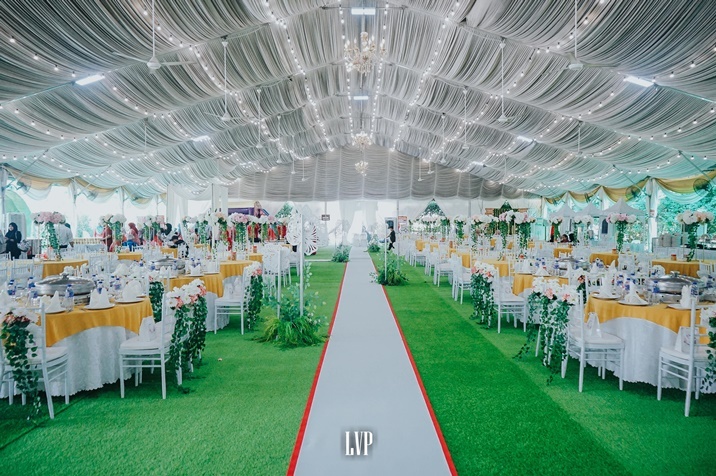 Dewan bertemakan garden ini sangat luas dan boleh menampung lebih 1500 tetamu. Paling best sudah tentu kawasan parking yang luas serta menyediakan toilet & surau. Sudah tentu CN berasa bangga kerana MZ Garden Hall ini adalah milik melayu bumiputera. 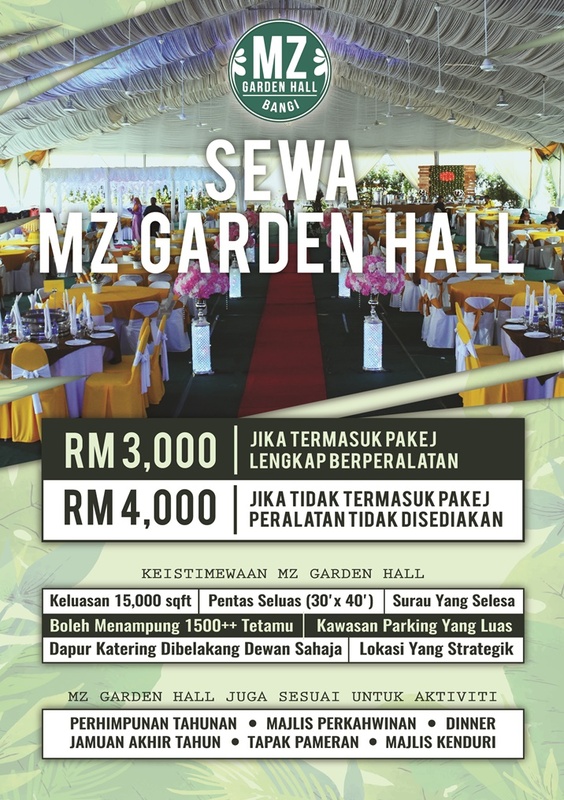 Harga untuk sewa dewan bertemakan garden iaitu MZ Garden Hall ini adalah serendah RM3000 sahaja ! 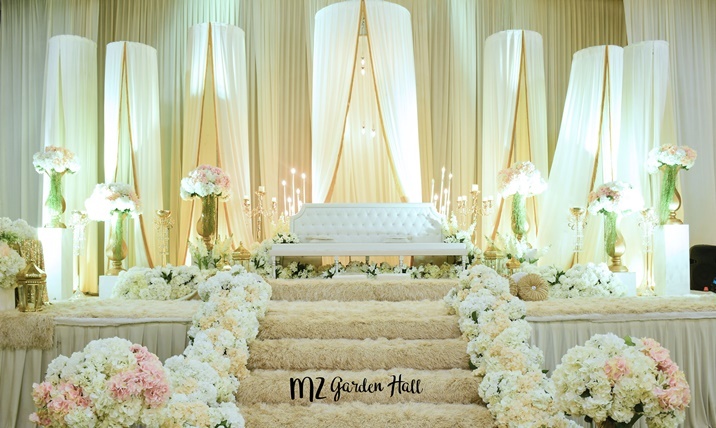 Anda lihatlah sendiri antara gambar hiasan dewan MZ Garden Hall ini. Anda boleh pilih tema anda sendiri & mereka akan jadikan impian anda kenyataan gituw. 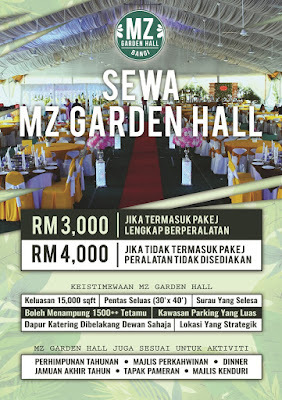 Jadi, jika anda mencari dewan bertemakan garden di Bangi pada harga yang reasonable, MZ Garden Hall adalah jawapannya. Selain MZ Garden Hall, ada juga MZ Diamond Hall yang dilengkapi dengan air-cond dan sesuai untuk majlis seperti seminar, kursus, dinner, birthday party malah reunion. 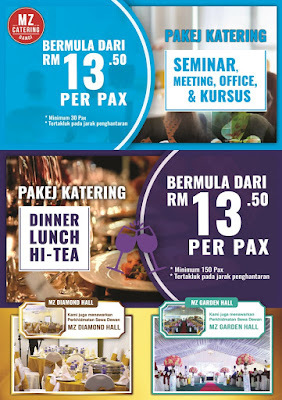 Untuk Diamond Hall ini, harga sewaan adalah serendah RM100 /jam. 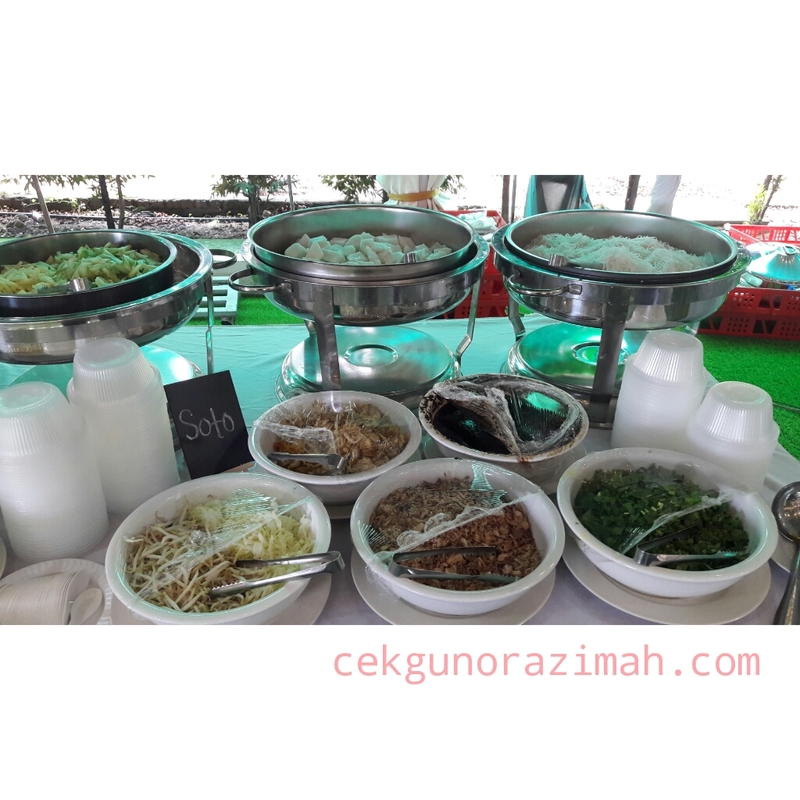 MZ Catering menawarkan pelbagai pakej katering untuk pelbagai majlis. Pakej bajet perkahwinan yang ditawarkan MZ Catering adalah serendah RM13.50 sahaja termasuk dewan/kanopi. 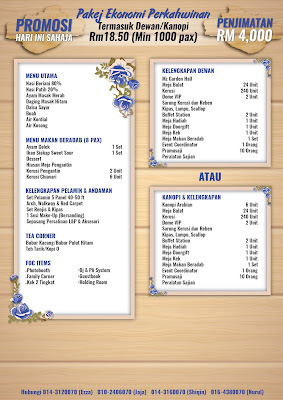 Murah bukan? 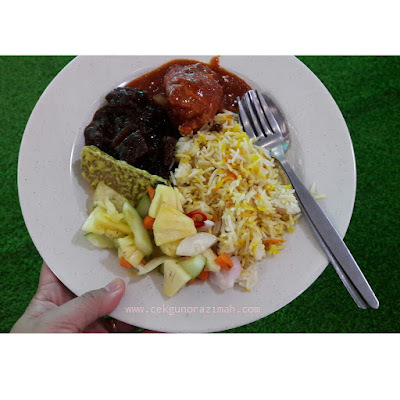 Menu untuk RM13.50 ini adalah nasi beriani, nasi putih, ayam masak merah, daging masak kari, acar jelatah, buah, air kordial, air kosong serta dilengkapi sekali dengan menu makan beradab yang merangkumi ayam golek dan ikan siakap sweet sour. 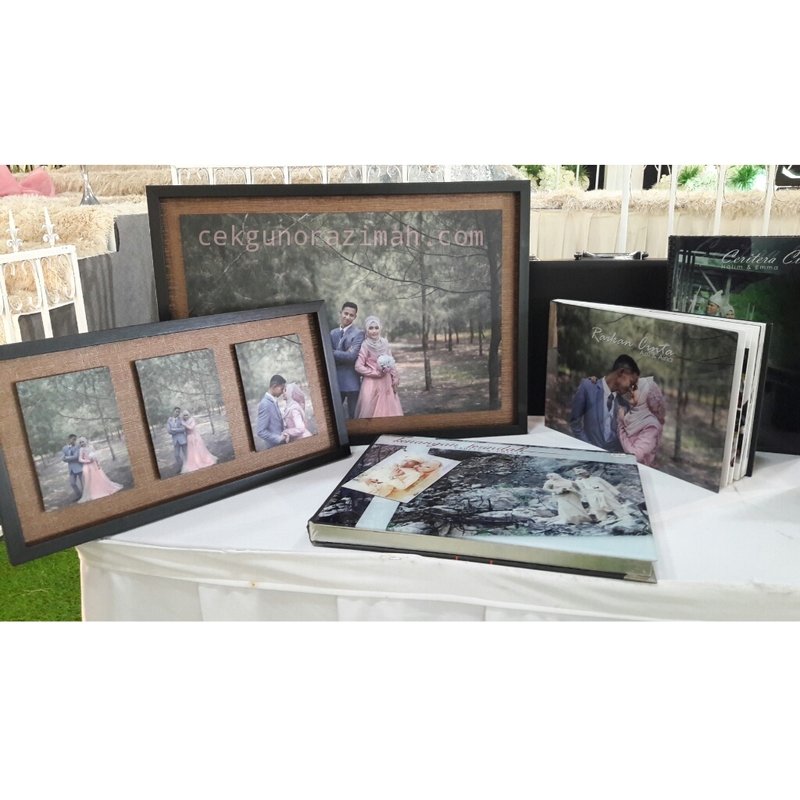 Malah dalam pakej yang sama juga percuma kek 1 tingkat & guestbook. 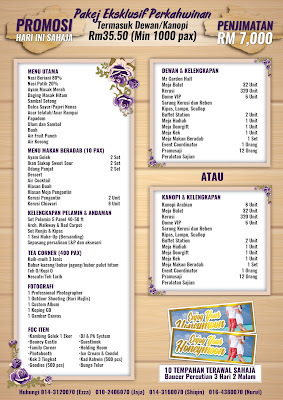 CN sendiri sudah mencuba menu nasi beriani, nasi hujan panas dan nasi minyak. 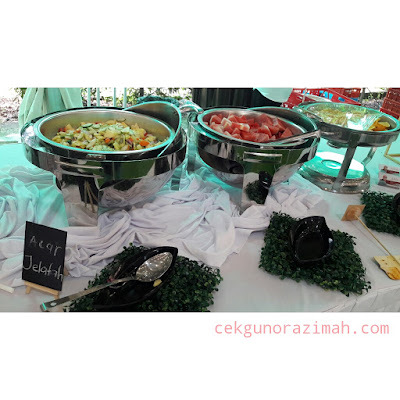 Memang sedap ! Oh ya, laksa MZ Catering juga mesti dicuba. 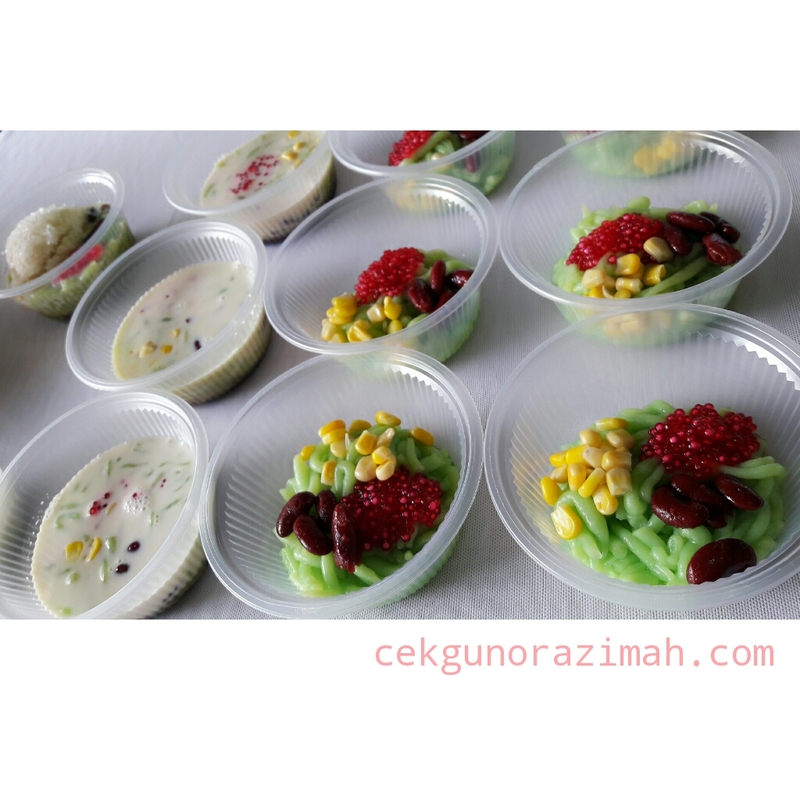 Sedap hokay. Bertambah-tambah CN makan. 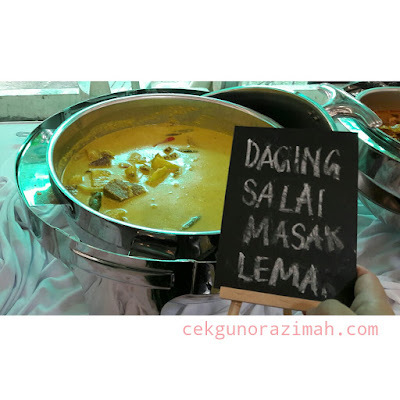 Laksa yang mesti anda cuba! 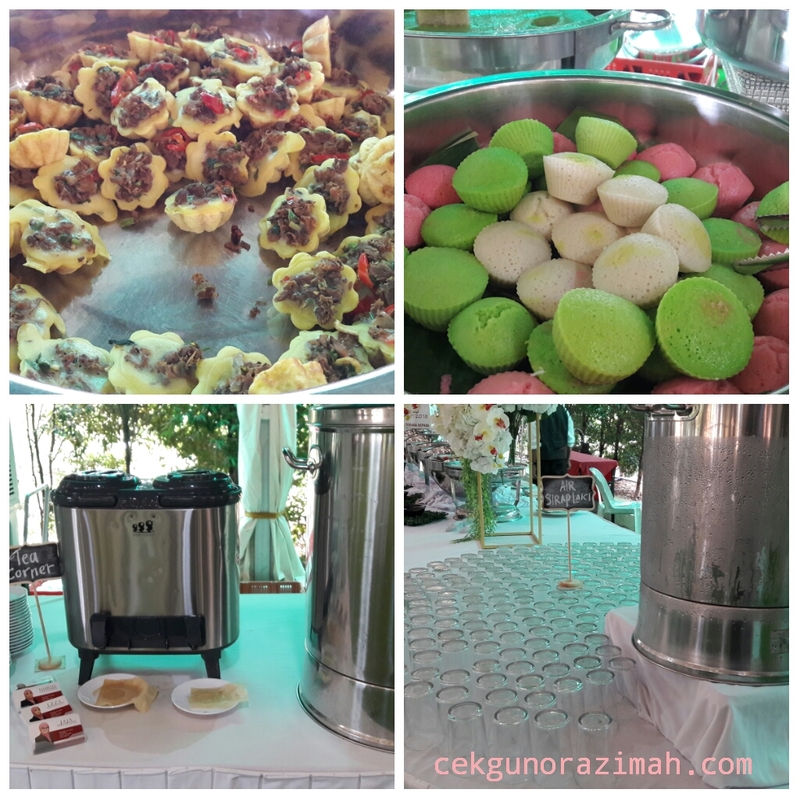 Menu di MZ Catering memang sedap! 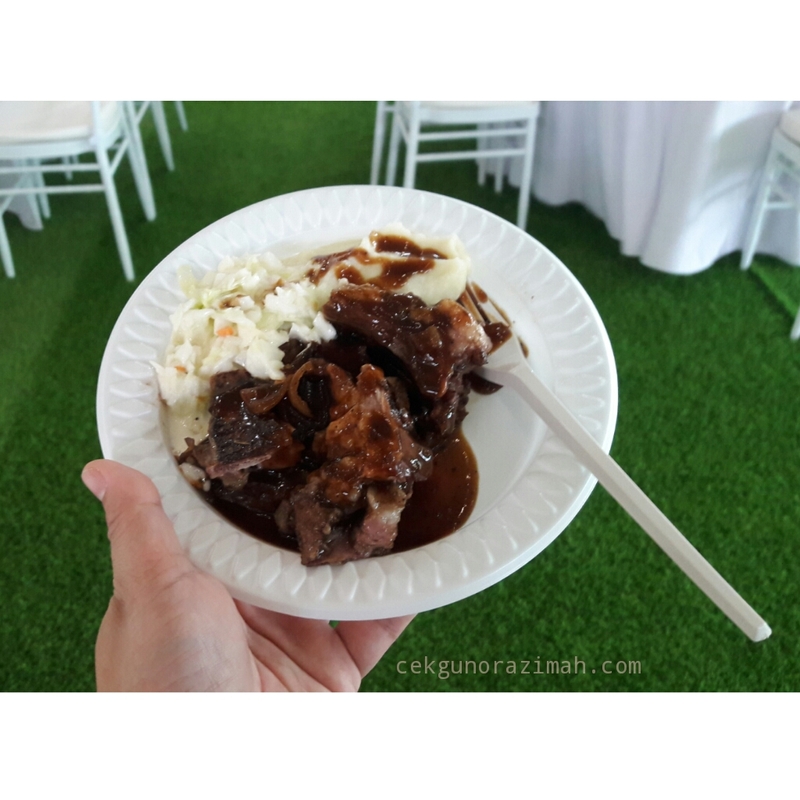 MZ Catering juga menawarkan pakej kambing golek serendah RM1300 seekor siap dengan sos black pepper, kentang putar & coleslaw. 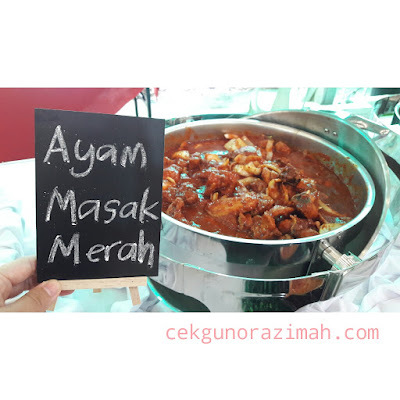 Kambing golek dari MZ Catering ini special sikit sebab lembut dan CN paling suka dengan sos black peppernya. Sedap ! Menjadi trend untuk setiap majlis adalah photobooth. 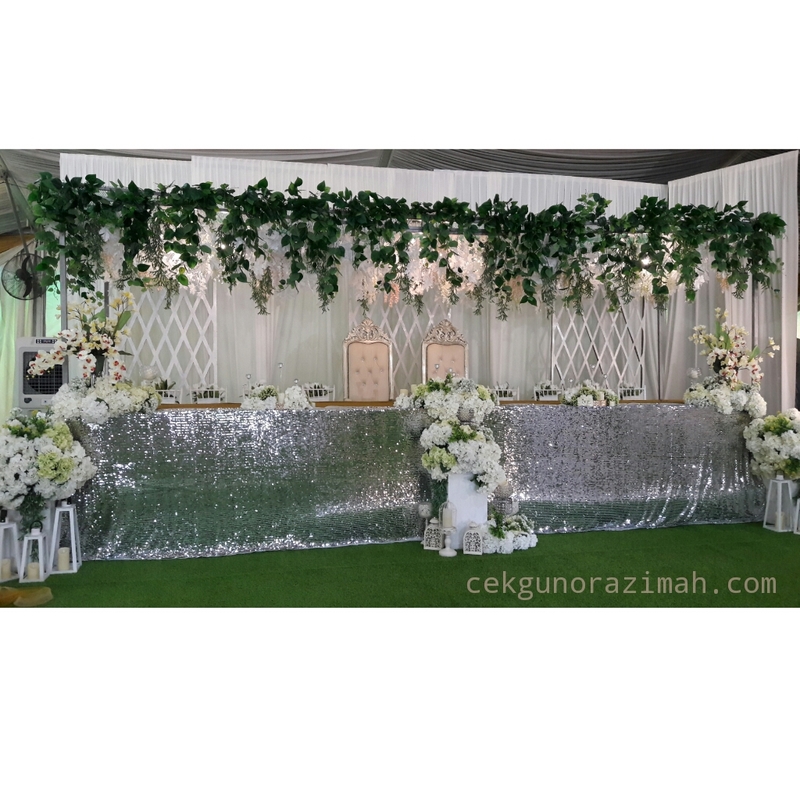 Di MZ Garden Hall, ada ditawarkan MZ Photobooth yang cantik terhias siap pakej dengan pelbagai set props yang menarik. 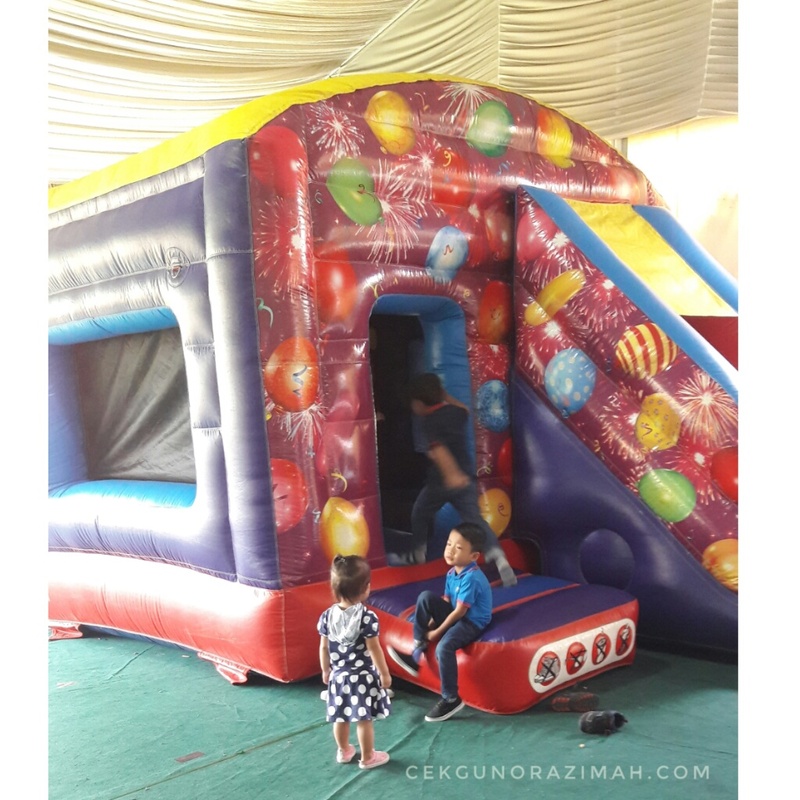 Uniknya di MZ Garden Hall adalah MZ Bouncy Castle yang menjadi tarikan kepada kanak-kanak. CN boleh makan dengan bahagia sebab anak-anak sibuk bermain di MZ Bouncy Castle ini tau. Berjam-jam di majlis kenduri kahwin tiada masalah dengan adanya MZ Bouncy Castle ini hokay. 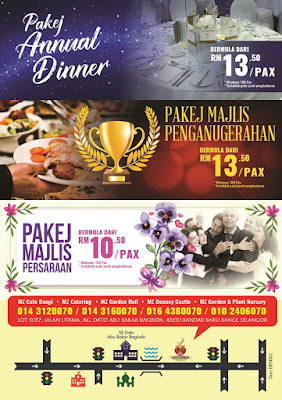 Berminat untuk menempah pakej lengkap perkahwinan di MZ Catering? Sebarang pertanyaan diluar waktu office, boleh PM terus ke Facebook : MZ Catering & MZ Garden Hall.